What Foods Help an Endomorph Lose Weight? You put on weight easily, have a high body fat percentage and have a hard time shedding fat -- you're an endomorph, one of the three body types in addition to ectomorphs and mesomorphs. Losing weight as an endomorph can be tough, but it's not impossible. Eat a nutritious diet and exercise regularly, and you'll see your body composition begin to shift. Endomorphs tend to naturally have a slower metabolism and be less active, compared to ectomorphs, who are naturally skinny with a high metabolism, and mesomorphs, who are naturally lean and muscular. These two traits together make it easy for endomorphs to put on body fat and hard to take it off, so they have to work extra hard to maintain a healthy diet and calorie balance. 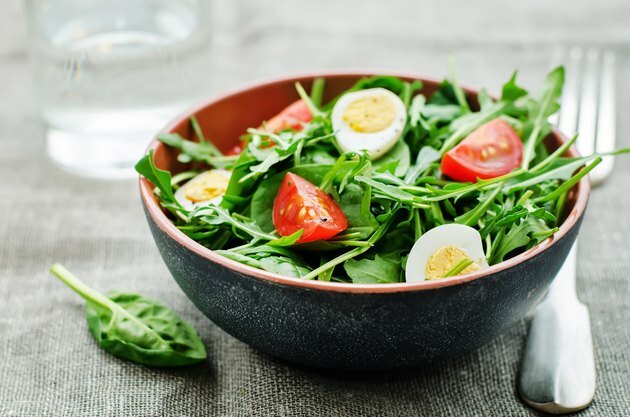 But, according to nutrition coach Ryan Andrews on the Precision Nutrition website, people usually are some combination of the three body types, rather than fitting perfectly into one category. Consulting with a nutritionist can help you zero in on your precise dietary needs for weight maintenance. A diet lower in carbs and higher in protein and healthy fats will help endomorphs lean out, says Andrews. That approach is backed by multiple studies, including a study published in The New England Journal of Medicine in July 2008. Study researchers found that obese participants following a low-carb diet or a Mediterranean diet rich in healthy fats lost more weight than people on a low-fat, higher-carbohydrate diet. Andrews suggests a macronutrient distribution of 25 percent of calories from carbs, 35 percent from protein and 40 percent from healthy fats. When lowering your carbohydrate intake, first cut out all unhealthy sources of carbs, such as added sugars, and all refined-grain products, such as white pasta and white rice. Choose nonstarchy veggies, such as leafy greens, over starchier, higher-carb options like potatoes and corn. When you eat grains, make sure they're whole grains, such as brown and wild rice. Whole grains are higher in fiber, which helps fill you up, and they digest more slowly to keep you feeling full. Choose lean protein sources such as fish, chicken and tofu to limit your intake of unhealthy saturated fats, and favor sources of healthy monounsaturated fats such as olive oil and walnuts. Proper portion control is important for endomorphs; even a slight boost in calories can cause you to gain weight. Andrews recommends using visual cues when portioning out foods at each meal. He suggests endomorphic women have one palm's worth of protein-dense foods, one fistful of veggies, half of a cupped handful of carb-dense foods and two thumbs' worth of fat-dense foods at each meal. For men, Andrews recommends doubling the amount of protein, veggies and carbs and eating three thumbs' worth of healthy fats at each meal.